There were many conversations at our Kick-off. From the first triad through the joint meals to the final harvesting, we were entangled in conversation. There were many topics that emerged during our time together. In this short text, I want to highlight some major themes that emerged during these two days. The major themes from my point of view were land, relation between people and institutions, community, diversity, identity and the role of stories. Thinking and talking about the futures of Europe was inspiring and challenging at the same time. Probably the most powerful moments in our conversations didn´t come when we found answers, but when new and different questions emerged. Therefore, I will also add some of the questions that came up our discussion here. Both to capture what was discussed, but also as a springboard for future discussions. Land, Nature and Cities – From preserving to nourishing? A theme that emerged often during the conversations was the topic of land. There was a sense of pride in and a sense of belonging to the places that make up the physical setting of Europe. Many of the moments in which Europe becomes tangible is through the experience of its diverse landscapes, cities and cultures. This relates often to travels and the easiness with which it is possible to be exposed to different places in a small amount of time. The beauty of Europe´s landscapes and cities was considered as one of its treasures. The cities with their old heritage and grown and grounded identities make up an important part of the stories. Here the theme of protection and conservation came up very strongly. How is it possible to preserve the richness of the land? This speaks to the experience that often the natural surroundings and the cultural heritage are not cared enough for. Personally, experienced an important shift in this discussion emerging during the conversation on “Beauty as a political aim”: The word “nourishing” entered the conversation, shifting the perspective from conserving and protecting the land towards a more proactive stance. Nourishing is much more than preserving. It is an active contribution and care for our surrounding. I also believe that the geography and the land was a key theme because it provides the basis for a sense of belonging. There might be disagreements about the political and economic set up of what we call Europe. But there is no denial that the people living in Europe are bound together by inhabiting the same place. Where people set boundaries, nature knows none. Talking about land, its beauty and how we can nourish it might be a powerful entry point for re-narrating the futures of Europe. If we think of Europe, the political institutions and the corresponding administrative bodies figure prominently. I believe that it is because these institutions are the embodiment and the visible expression of the political entity of Europe. Through its initiatives, the media coverage and it´s laws and regulations, the European Union is visible. And it is the arena for the political process of how a future for Europe might look like. At the same time, it is most likely the most abstract and invisible part which opens it for speculation and projection. The conversations around the political set-up of the European Union, including a debate if it is needed at all, were the most heated ones. Talking system and structures is a complicated matter. I do not want to go into detail, but rather share this image and some of the key questions that came up during the conversations. What struck me especially in these conversations was how the relationship between the political structures and processes were discussed. On the one hand this can be discussed from the viewpoint of representation. How is it possible that we ensure that the voices, needs and viewpoints that are carried by the people living in Europe are represented in the decision making and the regulations? At the same time, I was also irritated in a way: aren´t the inhabitants that make up Europe´s population “Europe”? This shifts the perspective from “Europe” out there to the fact that everyone enacts and is part of a “Europe”. A Europe that is made of the fabric of interactions and relations that make up our everyday live. From this perspective, there is no “Europe” out there, but only the “Europe” of our lives, communities and neighborhoods. Community – A community for Europe? Which brings us to a second line within the conversations. The topic of community emerged in two different variations. The first aspect related to the sense of belonging to Europe. Is there something like a European community, that feels itself belonging to the place (or values?!) and identifies itself with “Europe”. This question is in my point of view closely linked to the topic of identity and I will come back to it later. In a second thread the question of community also addressed the group that was present at the Kick-off Event. What is the smallest denominator in this group? Is there anything that we need to agree upon to continue our conversation? I believe that the event itself was an opportunity to experience ourselves in the company of others talking Europe. That is the first and smallest denominator: we committed ourselves to invest our time to jointly explore what Europe means for us. The motivations behind this commitment are diverse and manifold. But what I felt throughout the event was a concern or a fear that what we know of Europe, our experience with living, working and travelling in a peaceful and relative stable environment is about to change. And we can see clearly the signs of times that are worse, and not better. In the review at the end of the second day, I discussed with Rik and Clara Peters what it is that we are doing with Stories for Europe: today we provide a space for having a conversation about what our Europe is, what we hold dear within it and what we think it may become. Maybe it will change and maybe it is not enough, but in these times, it is a fruitful and direly needed thing to have: a real conversation about things that matter. Talking Europe always means talking diversity. From the personal stories highlighting the diversity of landscape and cultures, to the different viewpoints on what Europe can and should be to the diversity we had in the room: Thinking about Europe needs to address the question what diversity means for how we organize political systems and decision making and how we define community and identity. Again, this question had a general component and a component that was relevant and enacted in the room. I described our approach to invite diversity and create a safe space for voicing the diversity of opinions in another writing. As for Europe, there seems to be a tension between diversity and identity. Living in multicultural and highly diverse societies, it is a major theme how we engage with and represent diversity both in our everyday lives and the institutions that need to translate this diversity into political and regulatory frameworks. Yet, diversity might also be perceived as a threat to identity. And even if this is not the case, it raises some challenging questions regarding identity. From social psychology, we know that our identities revolve around conceptions of stereotypical group members. Closely related to the question of community is the word identity. Which in my opinion is the answers we give when asked “Who are you?”. In a very interesting session the place or shape of a European identity was discussed. Identity is also closely linked to what we hold dear and value for ourselves. Identity also outlines positions that we are ready to defend and to promote. An important question that came up during the discussion was the question “What is the Europe that we are willing to fight for?”. This question seemed a bit harsh for me at first, but it cuts right to the essence of identity: What are the non-negotiables for me? What (and is there anything) about Europe that I am willing to fight (and potentially sacrifice) for? 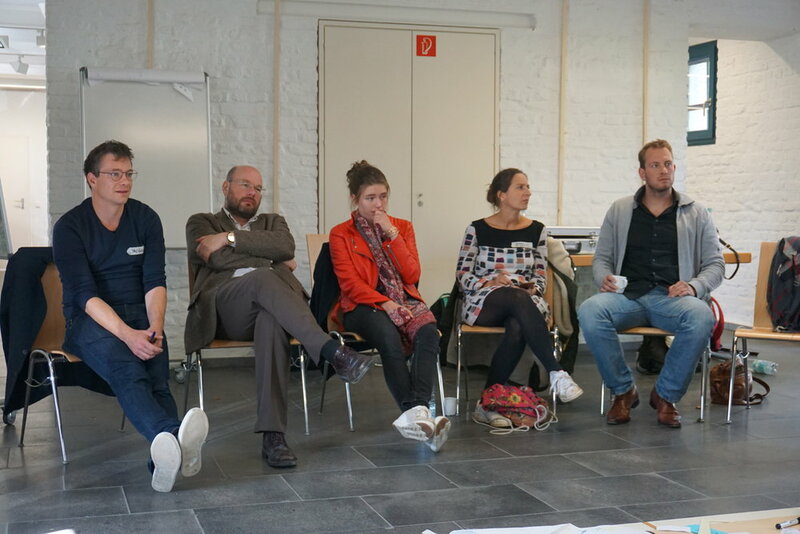 As part of the hosting team I am incredibly proud of the richness of the discussions and the thick and deep thinking-in-dialogue that happened in Aachen.